If you don’t already have one, you are likely still familiar with them. Those bands that people wear on their wrists that look like some piece of high tech jewelry or perhaps some oddly shaped watch. They are an outgrowth of the Internet of Things, and they are squarely in the tech space as “wearables”. Often, they are called by the catch all phrase “fitness trackers”. There are several manufacturers out there. Apple includes functionality on their Apple Watch. Several other players do as well, but for many, there is one name synonymous with fitness tracking devices, and that is FitBit. I have looked at these devices for awhile now, wondering if it made sense to buy one. Would I really use it? Would it be worth the investment? Are they durable enough to live through someone as awkward and clumsy as me? Following Christmas this past year, as we came into the first full week of the new year, I finally said “OK, let’s see what these things can offer”. There were certainly plenty of options to choose from, but for me, I figured if I was going to make the plunge, I’d go for the one that offered the most options to play with. That meant the FitBit Surge. So what does this somewhat chunky digital watch on steroids offer? It utilizes GPS Tracking. By way of triangulating your movements, it can determine the distance, pace and elevation climbed. From the main screen a couple of swipes can tell me the number of steps I’ve taken, how many miles I’ve covered, and how many flights of stairs I have climbed (up and down count as flights, so if you go up once and down once, you get two flights counted, etc.). It can keep track of your heart rate throughout the day. On the device itself, you can see your current heart rate, and on the FitBit web portal or mobile app, you can see your heart rate throughout the day, and the zones your heart rate has tracked through. You can see the number of calories you are burning throughout the day. It’s pretty cool to see what it says I have burned, especially when compared to what I track in other apps food-wise, such as LoseIt. I’m still just about thirty days into using it, so I’m not sure how accurate it is, but for what I do and the goals I’m currently reaching for, it’s been accurate enough. You can have the Surge monitor your sleep patterns. It can be fooled into thinking you are asleep if you lay back on the couch and watch TV, so it’s not an optimal sleep tracker, but in general, it still does a pretty good job telling you when you are motionless and when you are restless and moving about in the night. Another nice little feature is that you can set silent alarms (several if you so choose) so that you can be alerted at various times, or woken up without noisy alarms. You can set up call notifications and text alerts, so that you can get those updates on your wrist without having to dig for your phone. You can also control your music player on your phone or music player if sync’d via bluetooth. The FitBit pairs with a number of different mobile devices (iPhone and Android) and it also comes with a wireless USB dongle that you can plug into your computer and sync your data there, if you so choose. 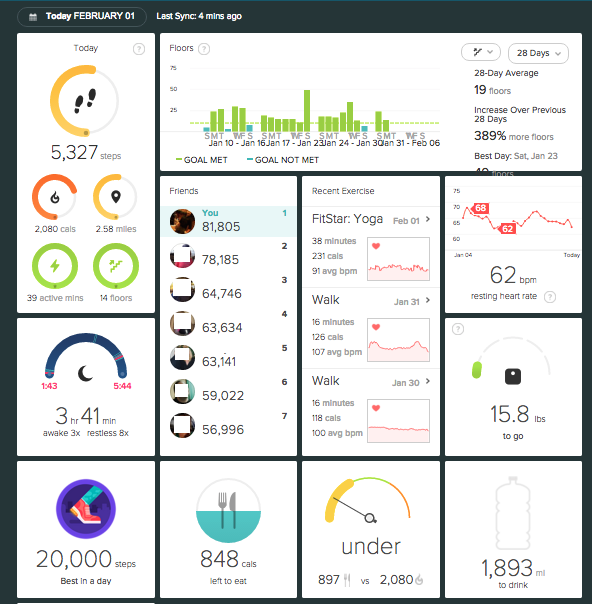 The FitBit dashboard allows users to see lots of collected data on their activity, and also allow synchronization with other apps. 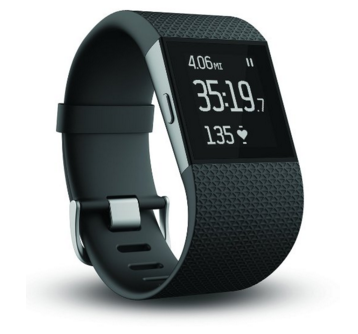 Standalone, I think the FitBit Surge is awesome. It tells me so much with just a few swipes, and what it tells me often spurs me on to keep doing better. It’s portal can collect a lot of data and you can look over days, weeks and months of past activity to discover trends and areas where you have improved, and areas where you need improvement. The sync options are good, but they are not universal. Apple’s Health app doesn’t sync with FitBit, but you can use a third party app like SyncSolver to read and write data. If you are using just a few companion apps, then this may be of little concern. The more apps you use, however, the more aware you have to be of the values being read and written to your various accounts. It’s very easy to get double and triple counts for activities if the proper read and write permissions are not set. Also, some apps incorporate the calories burned in activities as part of their calculations and some do not. An example is that, even though FitBit integrates with FitStar Yoga, when it reports the completion of activities, it still posts FitStar’s approximation of calories burned. In other activities that are manually posted (say through LoseIt) the option to select the FitBit and aggregate calories burned to the device and app is covered. Consider this a slightly long way of saying “check to make sure the data you are reporting and reading corresponds to what you are actually doing”. Final detail to mention is that the Surge has a decent battery life, but even it runs down over the course of a week. You will have to take of the device and charge it for about two hours to get back to a full charge. FitBit utilizes a proprietary USB connector to charge. If you were hoping to use a generic micro USB connector like you might with so many other devices, sorry, FitBit Surge has its own cable, and you have to use it. It’s certainly not the end of the world, but it’s something to be aware of, and an encouragement to make sure you know where that cable is. The FitBit Surge is a sweet little device, and on the whole I am quite happy with it. It’s flexible, adaptable, allows me to learn new stuff all the time, and its data portal is genuinely interesting. Syncing with iPhone apps in general is easy, though it has some quirks I’m still working with. It’s not a cheap investment, and you may decide you do not need all of the bells and whistles. If not, you can certainly get a lower priced FitBit item, or another brand. If, however, you are not full on Apple Watch geek mode, and want a device that can do a lot, tell you a lot about what you do, and not look obnoxious in the process, by all means, check out a FitBit Surge. Your body and health may well thank you for doing so.